In May of 2014, Koch Pipeline Company announced it will expand its Eagle Ford crude oil pipeline system. The installation includes an additional 24-mile, 16-inch pipeline in San Patricio County, which is located near the Texas Gulf Coast, next to Corpus Christi, TX. Company officials say the new pipeline will have an expected initial capacity of approximately 200,000 b/d. In 2012, the company completed a 20-inch crude oil pipeline between Pettus, TX in Bee County and Corpus Christi, TX. The installation at its onset transported approximately 250,000 b/d of Karnes County area Eagle Ford production. Koch, which has both Northern and Southern operations, recently attempted to gain a foothold in another major play, but was unsuccessful. In January of 2014, the company withdrew its proposal to build a 250,000 b/d crude oil pipeline in the Bakken Shale, in North Dakota, after not being able to secure enough commitments. The cancellation of this pipeline was surprising because more than 500,000 b/d currently moves out of the Bakken area by rail. Read more: Koch Cancels Proposed Bakken Pipeline - "Dakota Express Pipeline"
The company currently operates a 304-mile pipeline owned by Minnesota Pipe Line Company, LLC that delivers Canadian and Rockies crude oil, including Bakken, from Clearbrook, Minn., to refineries in the Twin Cities. In Texas, Koch operates about 540 miles of active crude oil transportation lines. 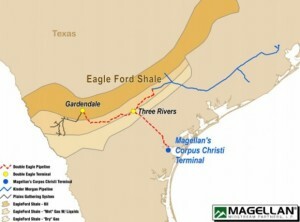 The new Eagle Ford crude oil pipeline expansion is expected to come online in the second quarter of 2014. Kinder Morgan Energy Partners (KMP) says it has secured long-term commitments for more than two-thirds of the 300,000 b/d capacity on its Kinder Morgan Crude and Condensate (KMCC) pipeline. The pipeline connects Eagle Ford crude and condensate to the Houston Ship Channel. 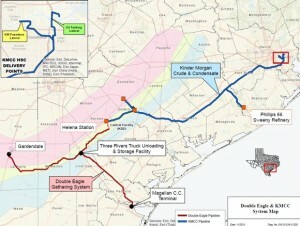 In January 2014, Kinder Morgan Crude and Condensate LLC and Double Eagle Pipeline LLC (a 50/50 joint venture between KMP and Magellan Midstream Partners) signed an agreement with Anadarko Petroleum to move its' Eagle Ford production to the Houston Ship Channel. Also in January, the company put its' ~$100 million Sweeny lateral into service. This lateral connects KMCC to the Phillips 66 Sweeny refinery south of Houston. KMP is investing nearly $300-million in additional supply laterals, connections, tanks and truck racks, supported by long-term contracts with customers. The company intends for these projects to enhance the connectivity of the KMCC system to additional Eagle Ford supplies and the Texas Gulf Coast market outlets. Portions of these facilities have been put into service to meet customer demand. All-together, company officials say Kinder Morgan's investments related to Eagle Ford crude and condensate opportunities currently total $1-billion. Projects in the works are expected to be online over the course of 2014 and the first half of 2015. Magellan Midstream Partners announced in late March plans to build a condensate splitter and make infrastructure improvements to its' Corpus Christi terminal for $250 million. According to company officials, the splitter will be able to process 50,000 b/d of condensate, supported by a long-term commitment from commodities trader Trafigura AG. — Jeff Kopp, Trafigura AG’s director of North America oil trading. The need for improved midstream and downstream infrastructure is growing to meet the demands of condensate production in the Eagle Ford. In 2013, the Texas Railroad Commission reported an average of 207,183 b/d of condensate from the play. In January of 2014, condensate production alone was 178,778. That's up drastically from 2011 and 2010 when condensate production was only 80,464 b/d and 18,784 respectively. — Michael Mears, Magellan’s chief executive officer. The project also includes construction of more than one million barrels of storage, dock improvements and two additional truck rack bays at Magellan’s terminal. Magellan pipeline connectivity between Magellan’s terminal and Trafigura AG’s nearby facility. Magellan company officials anticipate the new splitter and infrastructure improvements to be operational during the second half of 2016. Exterran Partners will spend $360 million to acquire natural gas compression assets from MidCon Compression, a subsidiary of Chesapeake Energy. These assets will be used by Exterran to provide contract services in the Eagle Ford and other domestic plays. Included in the deal are 334 compression units, with a total horsepower of ~440,000. rior to the deal, MidCon was the service provider for Access MLP Operating, a subsidiary of Access Midstream Partners, in the Eagle Ford, Permian, Barnett, Anadarko, Mississippi Lime, Granite Wash, Woodford, Haynesville and Niobrara Basins. At the closing of the deal, Exterran will enter a seven year operations agreement with Access Midstream Partners. BHP Billiton reported in February 2014 that portions of its Eagle Ford gathering system have been temporarily closed due to corrosion. The cause of the corrosion issue is at present being evaluated by the company. The gathering system closure was revealed in BHP's December 2013 financial report of Petrohawk. BHP is required to report operations updates and financial results to Petrohawk's debt holders, after acquiring the company in 2011. According to BHP, production is continuing in the Eagle Ford, despite the interruption from the line closure. The company has increased the use of trucking to deliver product to market, and claims that there should be no significant impact on production. Onshore U.S. drilling and development cost BHP $2.4 billion in the second half of 2013. About 75% of this expense or $1.8 billion was spent in the Eagle Ford, mostly in the company's liquids-rich Black Hawk acreage. The company achieved a 72% increase in production for onshore US liquids in the second half of 2013, which was primarily attributable to the Black Hawk acreage. In 2014, expenditures are expected to decrease in the second half of the financial year, following a 35% decrease in the company's active rig count to 26.